Many specialist skincare companies are founded by people who believe that they can make a difference. Few, if any, are founded by an Applied Chemist with an M.Sc/PhD in Analytical and Organic Chemistry. Very few have a deep understanding of the folk origins from which so much modern skincare is drawn. Our Managing Director, Dr Yemi Shode happens to be all of those things. Her passion for effective but gentle skincare products began during her undergraduate days when her sensitivity to synthetic skincare products forced her to start looking for natural alternatives. 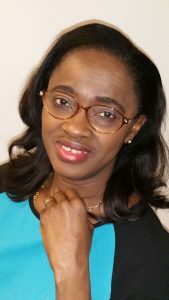 Yemi’s research lead her to Nigeria where she began to discover the wealth of potentials that exist in the natural raw materials and the efficacy of traditional West African Black Soap. Her unique knowledge and expertise drives the development of Yess Essentials products, bringing together the most effective naturally active ingredients with sensitively applied science. Her team’s search for ideas and innovation spans the Globe. From the heart of Africa to the frontier lands of Australia, the forests of South America and to the ancient wisdom of India. Yemi is committed to the well being of rural women and their families in West Africa and passionate in bringing out their values to the eyes of the world. Product Excellence – To provide skincare products that are original, naturally derived and of the highest quality. All Yess Essentials products have been tested and the PIF (Product Information File) obtained to comply with EU law for cosmetic/toiletry. Quality Throughout – To provide a service that reflects that quality throughout the process from initial sourcing of materials to the delivery of product to our customers. Impact Aware – To provide a product and service and ensure that we are aware of its impact; on the local community; on the environment; on the health and safety of all those connected to the product.